Language is the basic tool of communication. But it has limitations. It can only be used to exchange information and news. How much a kilo are tomatoes today? How do I go to Hill road from here? These questions can be answered through language. Apart from such basic communication language has very little use. All the poetry, literature, the so called deeper aspects of life may or may not succeed in carrying what it seeks to deliver because it is the subjective language of the author which is meant to share an inner experience. Language, as a basic tool of informing others of some piece of news or information is never in danger of extinction because it serves a specific purpose. Rest of the areas of language, like culture and the arts may or may not survive the test of time. It depends on its use by the members speaking that language. It may possibly disappear in time like quite a few languages in recent history. It’s like a certain style of embroidery or a particular genre of music. When a certain style goes out of use, outdated, it slows down. Renowned gazal master Pankaj Udhas held a gazal concert last week only for the benefit of the Indian youth because as he said “I want to introduce the young generation to gazal in particular and Indian music in general.” How reminiscent this is of our Sindhi elders inviting and pleading the youth to join Sindhiat. 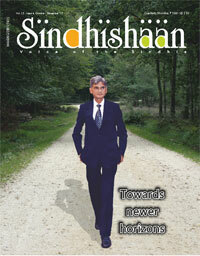 But gazal as well as Sindhiat has gone out of style, out of fashion, so what can one do? Same thing happened with books and the reading habit, it just went out of style when TV happened, internet happened and mobile phone happened. Current generation stopped buying and reading books. It was all on the net. So also were greeting cards killed by sms. The point is that certain things simply fall out of use, out of fashion over a period of time and then they slow down and die. Every generation of human beings as well as every generation of technological advancements invents new things, driving out the old things. Language, culture, the arts, embroidery, music, books everything is perishable, in time. Literature has been pushed aside by cinema, an improved form of communication, just as cars have pushed aside bullock-carts! Language too is an exchange of facts and figures. Anything more should not be expected of it. Language cannot deliver much more than writing a cheque or directing someone to his destination. The deaf and dumb with their sign language survive and even prosper equally well and, to my mind they are infinitely better than us talking animals! Talking of ‘talking’ – five areas of social life which are dominated by speech and words are politics, journalism, judiciary, education and religion. And if you notice closely it is exactly these five areas that stink of corruption and lies. On the other hand, a few other human enterprises have little to do with talking words and more to do with other human faculties like the hands, feet and brain. Science, medicine, industry, sports, military and so on rely less on the tongue and more on other above mentioned faculties and so are perhaps cleaner and healthier. The fight against corruption and lies in human society is a misdirected and futile fight simply because corruption is not a sociopolitical or economic subject. Corruption is a part of human crises, the crises of values and lifestyles. Politics and economics don’t reach that far to the human psyche or human heart. They can only make laws and regulations, leaving the values and lifestyles untouched. No branch of human endeavour, including religion, can repair or improve human condition. They can only worsen it. How can you ever teach selflessness to a deeply ambitious and violently selfish society? You can’t. You’ll be crucified, hanged or murdered. Most people suffer from a mountainous misunderstanding that they are very important, special and exclusive. They believe they are God’s gift to humanity. This is also one kind of corruption, emotional and psychic. This happens through any teeny-weeny excuse; someone may have stayed in the US and on his return may carry this massive misunderstanding of being extraordinary, US return. Someone might have made a quick buck and comes to believe he possesses special powers. Someone might have received a nondescript award and comes to feel godly! More and more people come into this state of corruption and begin exploiting others around them. A secretary of a housing society consisting of twenty flats behaves as if he owns the building. A watchman of a film studio comes to believe he is the next super star. One doesn’t seem to need any solid achievement to feel special. In fact this feeling of self glorification is entirely based on a lie and therefore doesn’t need any proof. It is enough that you believe in it, take it for granted and behave importantly. Society and culture encourage this lie, this corruption, by offering artificial means and pseudo identity certificates. Nowadays almost anything trivial can trigger this feeling of being powerful and special. It is a part of the educational curriculum, it is a part of the cultural upbringing, imparted everywhere that you are one and only, you are worth it and you have arrived. This kind of corruption breeds envy which is a destructive and monstrous behaviour, inciting violence and fear. In ancient China when the kings built palaces, they could not use glass on their windows; hooligans would throw stones at the palace windows, out of an uncontrollable envy. Even the modern-day fight against the western societies by the so called terrorist has the same element of envy and fear. In fact this ‘show-off’ behavior is meant to invite a violent envy in the beholder. And, as we said it is based on a lie, doesn’t need any proof and is self imposed and self congratulatory. The new expressions, ‘having an attitude’, ‘having a life style’, ‘having what it takes’, points at a society of nice but misdirected and dishonest generation. Now, much later, as I write this, trying to make sense of it, I realize what they perhaps may mean. Years back in my teens, I saw Osho for the first time, alone amidst the crowds surrounding him and I had felt him to be in this Absent Presence. Of course at that time I had no such expression with me, but now, in hindsight I’m sure he was in it. I remember at that time thinking of him to be like a cow. Often I had encountered cows on the streets, munching, and looking at Osho on that day I had remembered a cow and the Absent Presence. A toddler in a mother’s lap holds the same expression. U.G. has told us time and again ‘not knowing is your natural state.’ It comes to the same thing. Being absent from within gives one an illuminated presence. Being absent means being without thoughts, being empty, which is the same thing as being whole. Being absent is not a practice or a discipline. It just happens and then goes away, on its own. Most of the human society is very much present and in control. Being absent perhaps means being in a flow, being a mirror or as U.G. compares it to a movie camera. Life passes through you without any hindrance or resistance or choice from your side. Being absent is the natural state we are born with. It has been unnecessarily mystified and glorified but actually it is the most ordinary and normal way of being. “Absent Presence” is a natural and appropriate way of living with a light heart and peace.